Now that Cydia is pretty much a thing of the past, the hunt is on for the best alternative, and we have seen quite a few in the last few months. A new one that is striving for the top spot is called Cyrus Installer, and it offers something different to all the other Cydia alternatives we’ve seen – Cydia tweaks. The app offers a very user-friendly minimalist interface and has more than 80 tweaks and apps. That number is low compared to the other Cydia alternatives but this will expand in time, and the focus is on quality rather than quantity. Everything that the installer offers makes it the ideal installer for everyone, jailbreakers and non-jailbreakers alike. If you have ever used AppValley or TutuApp, you will find this one works much the same; simple to use, nothing complicated about it at all. Absolutely. Cyrus Installer has been fully tested, and neither the installer or any of the apps or tweaks in it contain any malware, adware, spyware or anything else like it. However, it is a free installer and, as such, ads are a part of it. They are unobtrusive though, and these do not present any security risk either. If you really don’t feel comfortable using it, you will need to wait for a new jailbreak and, by all accounts that could be some time away. To be fair, it offers you the tweaks without the security risks that go with jailbreaking because it doesn’t need access to the iOS root like Cydia does so it is a much safer alternative. Interested? Want to know how to download it? Read on. 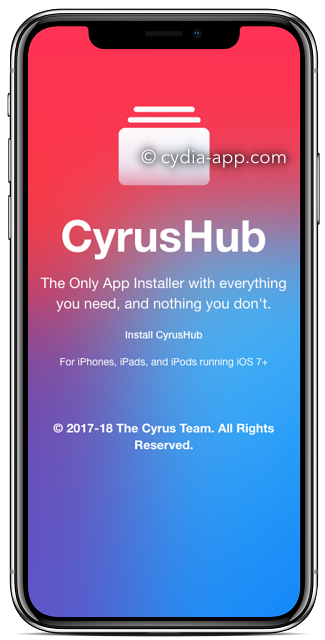 Update: Cyrus Installer has been reintroduced as Cyrus Hub. It retains the same functionality and even more, with a brand new intuitive interface. A decent internet connection – preferably WiFi although data will work. Provided the icon is there; you can now start using the app installer. Tap to open, find the app or tweak you want and download it. If the icon is not there, repeat these steps. If you go into the apps section, you can also download TutuApp. The most common error that appears is the “Unable to Download Apps” error. This is a certificate issue, and you must wait for the developer to fix it. To be fair to them, they are on the ball and tend to push out fixes within a few hours of the certificate error being dealt with. Don’t waste time; download Cyrus Hub today and install your favorite tweaks and ++ apps. Although the installer is free, the developers do operate a donation system so if you do like what it has to offer, be kind to the developers and provide a little support for them. That way, they can keep the installer maintained and continue to push out the relevant fixes and updates. Don’t forget to tell us what you think of this app and follow us on Facebook for more updates and news. hi, is Cyrus HUB not installing for you? it means they have got revoked by Apple. They would restore the enterprise certificates. Every 3rd party installer is facing the same issue.